The Seaview acrylic canvas range of kit bags can be personalised at one end with two letters or numbers, or a combination of letter and number. We have decorated the top of the bag with a geometric N in white. We cut out the letters and numbers by hand, before sewing them onto the bags with traditional sailmakers zigzag stitch using white U.V. resistant thread. They have six deep internal pockets. The webbing handles go right around the bag, the navy bag has navy webbing handles and the grey has black handles. We add an extra layer of canvas at the base of the kit bags to protect and add durability to the bag. The barrel bag does not have the double layer on the base. It has longer webbing handles that allow it to be worn on the shoulder or by ones side. 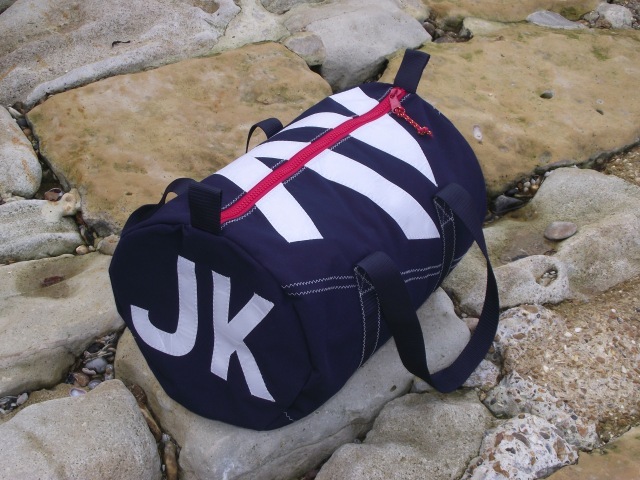 This is a very popular kit bag and an alternative to the white sailcloth kit bags. This stylish and practical material makes it great for taking away on weekends sailing, sporting events and to the city. They make fabulous presents for birthdays and anniversaries. Care instructions: They can be washed gently at 30 degrees with eco-friendly liquid. Dry naturally away from direct heat. Please do not be tempted to add bleach, do not tumble dry and do not dry clean. Medium: 50cm length x 32cm diameter. 40 litres approx. Large: 60cm length x 38cm diameter. 68 litres approx. Large Long: 70cm length x 38cm diameter. 80 litres approx. Extra large: 70cm length x 45cm diameter. 111 litres approx.